Debate: Which driver is most likely to win another Daytona 500? Winning the season-opening Daytona 500 is a prestigious honor. Winning multiple Daytona 500s puts you in select company with some of the best in the sport. Richard Petty (seven wins), Cale Yarborough (four wins), Bobby Allison (three wins), Dale Jarrett (three wins), Jeff Gordon (three wins), Bill Elliott (two wins), Sterling Marlin (two wins), Michael Waltrip (two wins), Matt Kenseth (two wins), Jimmie Johnson (two wins) and Dale Earnhardt Jr. (two wins) are the 11 drivers who have multiple Daytona 500 wins. Johnson, Kevin Harvick, Ryan Newman, Joey Logano, Denny Hamlin, Kurt Busch and Austin Dillon are the active full-time drivers who have at least one “Great American Race” victory on their resume. Which driver is the best bet to add another Harley J. Earl Trophy to their trophy case? NASCAR.com’s RJ Kraft and Jonathan Merryman debate. KRAFT: This question is making me flash back to the most recent race on a superspeedway in October of 2018 at Talladega, a race in which Stewart-Haas Racing led a dominating 155 of 193 laps. Kevin Harvick led 46 laps that day and consistently was part of the lead pack. I realize Talladega and Daytona are separate and distinct animals, but some similar characteristics abound when it comes to plate racing — note that this will be the last plate race. I am taking Harvick to be the next driver to add another “Great American Race” win to his ledger. He narrowly won here in a fabulous 2007 finish against Mark Martin. He led a race-high 50 laps in 2017 and finished second and first in the opening two stages. “Happy” also finished fourth in the 2016 race and second in the 2015 race. With the exception of Austin Dillon (who has 24 fewer Daytona starts than Harvick), he has the best average finish at Daytona over the entire category of his Cup career among previous Daytona 500 winners. 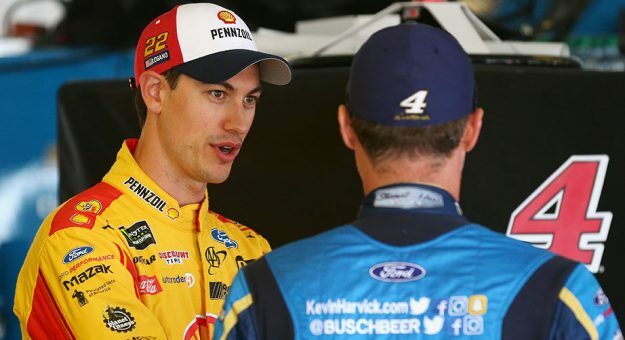 Plus, I think the sting of losing the 2018 title at Miami in the manner he did — without his regular crew chief and car chief — is going to put an extra chip on Harvick’s shoulder out of the gate, and I expect him to come out blazing in the 2019 Ford Mustang. MERRYMAN: Harvick was a solid pick from 2010 to 2016, but as of late, I think Joey Logano is your guy. In the last four Daytona 500s, he has one win and four top 10s. His worst finish in that run is sixth. While their averages at Daytona are similar, this debate is more of a “what have you done for me lately,” and the front-runner has to be Logano. The driver of the No. 22 Pennzoil Ford Mustang is one of the best plate racers in the Monster Energy Series and has one of the best spotters at superspeedways in TJ Majors. The duo paired up last season and nabbed the win at Talladega in the spring en route to their first Monster Energy Series championship. That brings me to my last point: Momentum. The No. 22 team is riding that championship wave all the way to Daytona Beach so look out for Joey nabbing his second Harley J. Earl Trophy.